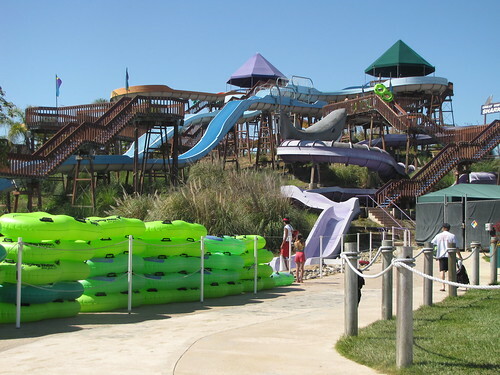 Groups of young globetrotters anticipating the Golden State getaway of a lifetime, looking for the best of the best and the biggest bang for their buck will definitely want to set a stop at this long-time favorite Sacramento area waterpark at the top of their West Coast itinerary! Located in the heart of the city at Cal Expo off of Capital City Freeway, Raging Waters, Sacramento’s largest waterpark, serves up dozens of exhilarating water attractions, breath-taking slides, crystal clear wave and wade pools and an exciting array of fun-filled activities for children and adults of all ages. Exhilarating body slides like Splashdown, Hurricane Bay and “Stingray and Manta” quench every need for speed, while awesome tube slides like Honolulu Half-Pipe – a gargantuan wave that opens with a nearly vertical surface and provides daring riders with the heart-in-mouth thrill of “free falling”, and Mako – the tallest, fastest inline water luge in Northern California – promise everyone in your bunch a rippin’ good time! Waterdogs with a nose for more chill than thrill can cool off in the tranquil waters of the Calypso Cooler Lazy River, make a beeline for Breaker Beach and Northern California’s original wave pool, or explore the many secrets of Treehouse Reef, a five-story children’s attraction serving up, oh, at least a gazillion gallons of fun. For the water warriors amongst you, The Dragon’s Den is the ultimate ride for those craving a “death defying” water slide experience; diehard daredevils catapult through five stories of terrifying darkness before plummeting into the mist-shrouded “abyss of the dragon” where they vanish from sight; where will they resurface?